It was our 12th wedding anniversary at the end of April so we decided to get away for the week, just the two of us. I found a lovely little chalet at Mundesley, Norfolk. We had chalet 45 and I have to say that the mattress in that chalet is THE BEST I’ve ever slept on. Previously I’d have said the one at the Featherdown Farm we went to was the best but this was even better. I usually wake 4-5 times a night with back pain. Our first night there, I woke to go to the toilet and was very surprised to find that I didn’t have any pain at all. I didn’t wake again during the night and I didn’t have a bad back when I woke in the morning. This was totally unheard of for me. I’m now scouring the internet trying to find an equivalent mattress because it’s been discontinued. Just my luck! Ant set our route and we took the scenic way there. We couldn’t get into the chalet until 4pm so it was nice to take our time and enjoy the drive. We stopped at Tesco on the way and did our weekly shop. I love doing a holiday at Tesco. It’s the one week where we don’t worry about the cost of things. We treat ourselves to Tesco Finest instead of Tesco value! We have croissants and pastries for breakfast and we have real butter rather than buttery spread! I took loads of photos. I think it’s the busiest my Instagram has been for months! Our first stop was 2 minutes down the road. I needed a Costa coffee! 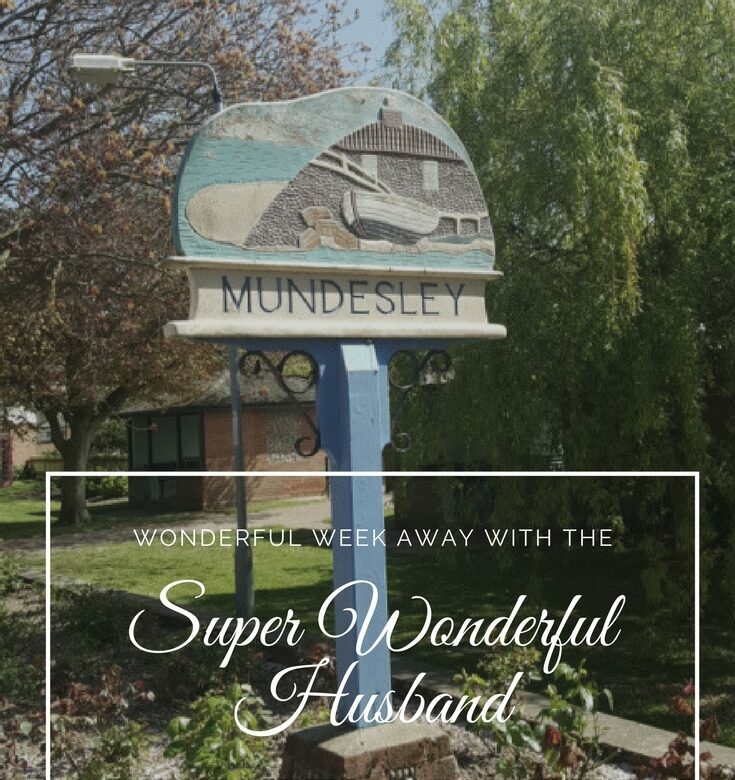 We fell in love with Mundesley. It’s such a lovely little place, so clean and everyone was really friendly. I saw these in the pound shop and had to have them to go around our wildlife pond. We did lots of shopping. We didn’t pass a charity shop without going in and these are just a few of the books we bought! At W. H. Smith and Jarrold we spent my £50 book token I got the other month. It’s really hard to ‘pay’ £7.99 for a paperback when you’re used to getting them for a pound from the charity shop! I only got them because I had the book token. I’d never have been able to use my own actual money! I did get some deals though. At W.H. Smith, they had buy 2 get 1 free on children’s books so I bought 3 Disney Twisted Tales books. For our anniversary dinner, Ant made potato dauphinoise, garlic roasted green beans and mushrooms and steak. It was all delicious. The steak was cooked to perfection and I could just eat it all again right now! We spent a lovely afternoon at Mundesley beach and collected some interesting looking stones and rocks to use when I make my alpine and succulent raised bed. We spent bank holiday Monday afternoon in the chalet, watching Jason and the argonauts. I missed Clash of the Titans in the morning as we went shopping but I couldn’t miss Jason! On our way back from a shopping trip (can’t remember which town we’d been too) we stopped at a farm shop and picked up some homemade scones. It was gorgeous. I did a small cross stitch teddy bear when I wasn’t reading or shopping with Ant. I hadn’t done any cross stitch for years and I forgot how much I enjoyed it. We went to Great Yarmouth for the day. We were very impressed and can’t wait to take the kids. I was tempted to go to the miniature village but we know the girls will love it so we decided to wait and take them, hopefully in the summer. I loved the penny arcade. To play the machines, you had to buy 12 old pennies for a pound. I tried the fortune teller and my fortune was ‘A Husband’. Ant tried and his fortune was ‘A Divorce’!! I had warm, freshly made doughnuts while walking on the seafront and they were delicious. It was freezing all the while we there but we still enjoyed ourselves. All in all, it was a wonderful week with the super wonderful husband, even with everything I forgot to pack (hairbrush, slippers, pillows, towels and coat!) and with the DVD problems we had. I have to hold my hands up and say they were nearly all my fault! Every time we go away, we seem to have DVD problems. Either they don’t work or there isn’t one! This time, Ant decided to take our portable DVD player just in case. It was a good decision because it turned out there wasn’t one. We like to take movies and boxsets to watch in the evening because we record all our TV programmes on the TiVo so we don’t have to watch adverts. I took our Games of Thrones seasons 1-5 boxset that we haven’t had a chance to watch together yet as well as the four Hunger Games movies and Kingdom Hospital by Stephen King. Firstly, we couldn’t connect the DVD player to the TV because we needed a SCART adaptor. We bought one on Monday (it cost a fiver which was very annoying because we knew we had more than one at home!) and sat down to watch Game of Thrones Monday evening. All was going great. Disc one finished and we both agreed that we were going to enjoy GoT. I went to get disc 2 out and it wasn’t in the box. I’d tried to watch GoT a while back and I’d left disc 2 in the DVD player in the bedroom! It was a little disappointing but there was nothing we could do (not enough data to download or watch online) so we watched the first and second Hunger Games movies on Wednesday afternoon when the weather wasn’t very good. Ant went to put the third disc in only to find, for some reason it was a Blue-ray, not a DVD! We had to watch Kingdom Hospital instead. Whilst it was ok, and I will watch the whole series, it wasn’t as good as I hoped it was going to be. Next time we go away, I’m going to make sure to check and double check everything, as well as making lists so I don’t forget anything!